As I was running at 25k last week, I started feeling areas of my soles that were getting sensitive. After the run I checked my feet and there was some blistering. Not a lot because I have been running consistently and my feet are accustomed to it. But this was a new distance for me. I am training for a [marathon](escalante-link) and this was a new long run. I started to wonder about my socks. I think I have had these same pair since I was first coerced into being a runner (thanks Chase) back in 2009. Needless to say, they are looking a bit worn. With this information, I postulated that good socks might just make a difference for healthy running feet. Today was another long run and a new longer distance. Not wanting blisters, and curious about my postulate, I searched my sock drawer for my best (least lousy) pair of running socks. I used those socks and my feet were much happy for this run than they were for the previous long run. 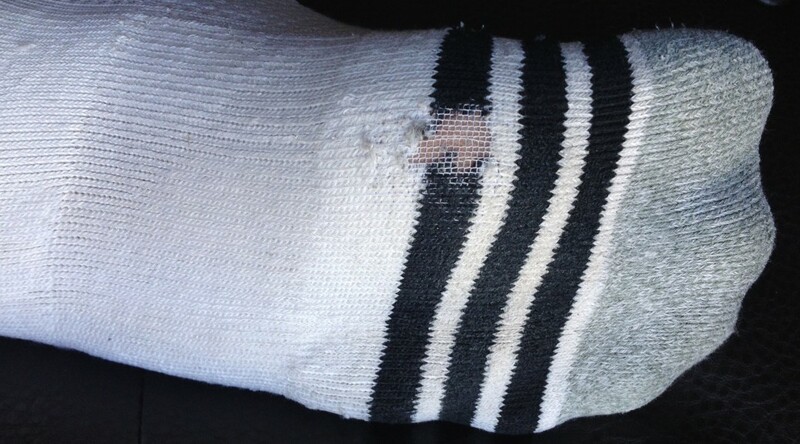 It looks like it is time to burn all my old running socks and hit up the sports store for some new ones. Whether my postulate is correct or not, it is certainly time. Have good socks made a difference for you? The Ragnar Relay Wasatch Back 2009 birthed at least one new runner. 24 hours of pure insanity. The Ragnar slogan is completely apt: “Run. Drive. Sleep? Repeat.” Why would anyone actually pay money to endure the torture? Let me tell you my story and perhaps you can understand how Ragnar got into my blood and now has me looking for more.